I rarely watch the national leaguers outside the World Series so ypu would def know more than me about that. Really? You don't believe in donating to hurricane relief? Good game. 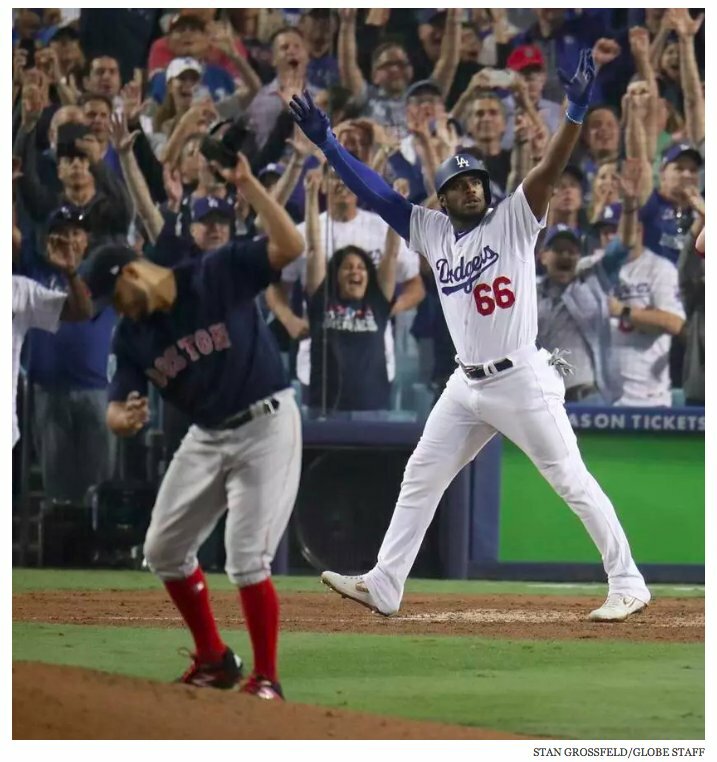 Hoping the Dodgers can at least push the series back to Boston. FLRacingFan and Greg like this. He missed his calling. Trump as baseball manager I would approve of. It seems like Sox take almost the entire game to wake up. I wouldn’t have figured they’d come back from 4 runs but actually score 5 additional runs. Nuts. FLRacingFan, Greg and gnomesayin like this. Seems unimportant now, but yes, could have been a legendary moment. That was almost me with the PS4 controller. Then I realized those suckers cost 65 a pop. Kimbrel's posture while the catcher is giving signals is unlike anything I have ever seen or at least recall. Crouched over with his free or throwing elbow up, long red beard facing the batter, like some monster giant insect ready to attack. I mean,Pearce almost got his foot lopped off. Unbelievable. This is the world series. A little leaguer during the first week of practice would be made to run laps if they thought he did not run it out to first. Maybe even get tagged with a slackers nick name. Very few things are as fundamental or as ABC 123 basic. Worse than a fumble, missed catch, or error, this is just being casual the worst time. IMO at the professional level it demands being cut or traded as a sign to others that there is zero tolerance. Machado's value went down for sure, LA won't resign him. gnomesayin, TexasRaceLady and Greg like this. David Price ain't never going to hear a negative thing relating to baseball from me as long as he's alive. Well here we go, boys. I'd like to see the Dodgers at least make some noise here. Sale to potentially close it out. Red Sox have gone all in in this game. If there is ever a game 6, it would be interesting to see who would start that one. Boston Red Sox 2018 World Series Champions! Mopardh9 and Reck like this. Congrats Sox fans. They were the better team. This is going to be a tough act to follow next year. David Price beat Justin Verlander and Clayton Kershaw head to head to clinch ALCS and WS. Was a foregone conclusion all year. Very boring season.